"Character cannot be developed in ease and quiet. Only through experience of trial and suffering can the soul be strengthened, vision cleared, ambition inspired, and success achieved" ~Helen Keller, first deaf blind person to earn a college degree. or the times you laughed out of sheer joy? Let us say you have a problem on your mind and it just would not go away. Go bowling. Don’t know how? Just give it a shot. A safe haven can take many forms. It can be a song, a movie, even a person or animal. The main thing is allow your self to get completely involved with this new activity. The safe place exists only as a helping hand, not as a solution to your life's problems, may it be small or big. It serves only as an escape route. Below please find a temporary escape for you. How do you get through tough times? 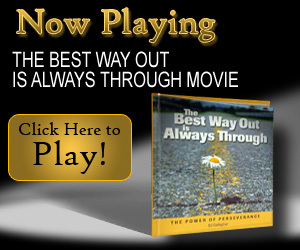 The Best Way Out is Through movie is a wonderful dose of inspiration to get through challenging times and envision triumph. Take a few minutes to enjoy this message of perseverance that is filled with encouragement and inspiration to stay motivated to make 2010 the best year yet!